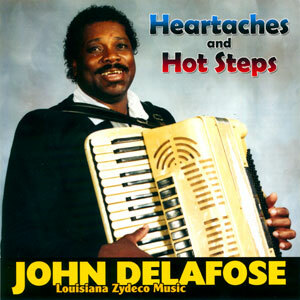 John Delafose was born in the rural community of Duralde, Louisiana, April 16, 1939. Starting on fiddle as a child, Delafose moved to harmonica and eventually accordion, the instrument for which he is best known, leading his zydeco band, the Eunice Playboys. He played local dances in his younger days, but retired from music after his marriage. At the age of 30 Delafose began playing again, quickly establishing his music as some of the most distinctive in the black French idiom, firmly based in the older traditions but also with contemporary ingredients. John Delafose & the Eunice Playboys have often included his own sons on a variety of instruments. He has made a number of records, the most successful being “Joe Pitre A Deux Femmes,” a local hit for him in the early ’80s. John Delafose passed away in September of 1994 after a brief illness, during the aforementioned strong second wind of his musical career. He was succeeded as bandleader by his son, Geno, who carries on his father’s unique style.